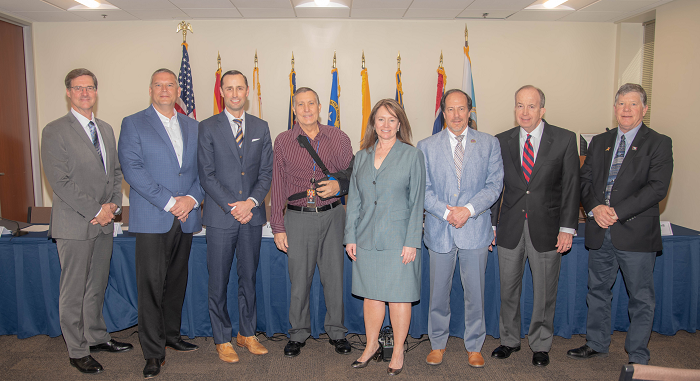 On March 19, 2019, the Governor’s representatives of the seven Colorado River Basin States and key water districts formally submitted Drought Contingency Plans to Congress for immediate implementation. “The Department of the Interior commends the Basin States and key water contractors on this important milestone. Given their successful efforts to reach consensus on the DCPs, the Department terminated its request for input from the Colorado River Basin States," according to Bureau of Reclamation Commissioner Brenda Burman. The Basin States Letter to Congress and the Reclamation Rescission Letter are available for downloading. Historic legislation ratifying Arizona’s Drought Contingency Plan (DCP) and marking the passage of one of the most significant pieces of water legislation in Arizona since the Groundwater Management Act of 1980 was signed by Governor Doug Ducey on Jan. 31, 2019. The legislation allows Arizona to join six other western states and Mexico in signing an inter-state water agreement and spells out ways Arizona will contribute to conserving more water from the Colorado River. Since July 28, 2018, 40 stakeholders (DCP Steering committee) representing diverse interests from across Arizona have worked to develop what’s known as the Intrastate Drought Contingency Plan. The plan balances water reductions in the state to ensure no one user takes the entire burden. One that authorizes ADWR Director Tom Buschatzke to sign onto the interstate Drought Contingency Plan on behalf of Arizona. The DCP Exchange of Letters is available here downloading. The Arizona Department of Water Resources (ADWR) and Central Arizona Water Conservation District (CAWCD) are committed to bringing the Drought Contingency Plan (DCP) to closure in Arizona by addressing a broad range of issues that respect the concerns of all stakeholders across the state. See joint May 3rd statement here. To launch that dialogue, ADWR and CAWCD on June 28 hosted a public briefing on the Colorado River Drought Contingency Plan to address the reliability of the Colorado River System and the risks to Arizona’s Colorado River Supply. See joint June 28th statement here. In response to ongoing historic drought conditions in the Colorado River Basin, and in order to reduce the likelihood of Colorado River reservoirs – particularly Lake Powell and Lake Mead – further declining to critical elevations, the 7 Colorado River Basin States, along with water entitlement holders in the Lower Basin, have developed a set of draft agreements to implement Drought Contingency Plans (DCPs) in the Upper and Lower Basins. The agreements include an Upper Colorado River Basin Drought Contingency Plan and a Lower Colorado River Basin Drought Contingency Plan. The Upper Basin DCP (consisting of a Drought Response Operations Agreement and a Demand Management Storage Agreement) is designed to a) protect critical elevations at Lake Powell and help assure continued compliance with the 1922 Colorado River Compact, and b) authorize storage of conserved water in the Upper Basin that could help establish the foundation for a Demand Management Program that may be developed in the future. The Lower Basin DCP (consisting of a Lower Basin Drought Contingency Plan Agreement and the attached Lower Basin Drought Contingency Operations) is designed to a) require Arizona, California, and Nevada to contribute additional water to Lake Mead storage at predetermined elevations, and b) create additional flexibility to incentivize additional voluntary conservation of water to be stored in Lake Mead. The parties have also developed a “Companion Agreement,” in which the parties endorse both the Upper Basin and Lower Basin DCPs, agree to implement both DCPs in good faith, agree to consult during operations to avoid future litigation and reserve legal rights in the future. The Upper and Lower Basin DCPs contain actions in addition to the provisions of the December 2007 Colorado River Interim Guidelines for Lower Basin Shortages and the Coordinated Operations for Lake Powell and Lake Mead and are available here for downloading. For more information on Colorado River conditions go to ADWR's Colorado River Management Shortage Preparedness webpage. Steering Committee Members - The Steering Committee will meet on the following dates. All meetings will be held at CAWCD headquarters. Tuesday, February 19 from 9 - 11 a.m.